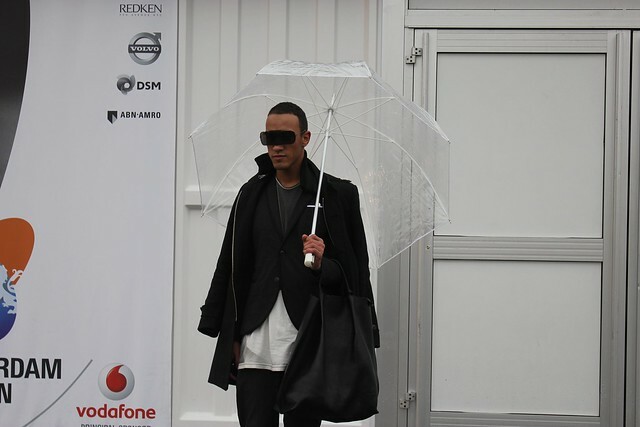 Today, I headed to Amsterdam Fashion Week. Unfortunately, I came to early to catch Grazia Magazine’s show by Elise Kim, but I met a few people there and snapped some pictures of fashionable attendees. I could not get over this Givenchy handbag! It had beautiful structure and contrasting details. I could only dream about owning a showpiece like this! One trend that popped up quite a bit was the colour orange. Tangerine tango is the it-colour of 2012, according to Pantone, and it is without a doubt, the Netherlands’ signature hue. 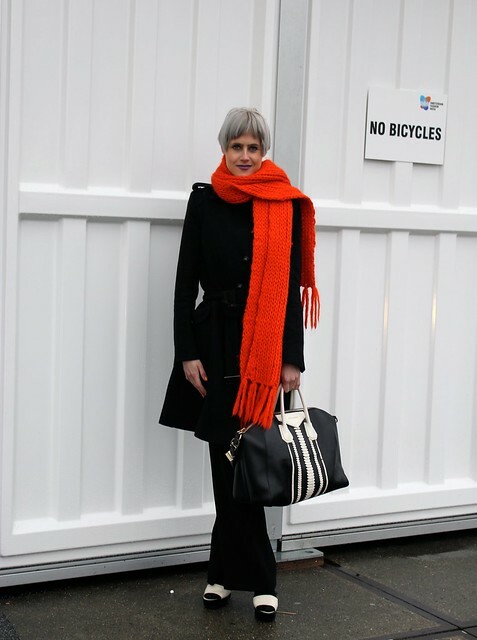 The colour popped up on accessories, from boots to scarves. There was only a light drizzle today, but this umbrella is more about drama than functionality. His sunglasses were unlike anything I’ve seen before, and he’s got layering down pat. I’m starting to learn from Dutch people, layering is essential in this dampness! This model-off-duty caught my eye. Very casual chic, and she’s brave to wear nylons in this cold, wet weather. I’m in love with her rose gold collar necklace… and her simple, black Prada bag. People in the Netherlands dress pretty different than what I’ve seen in North America. Nothing is begging for attention, and a high-quality designer handbag is the centrepiece of any outfit. I guess I’m used to seeing Torontonians decked out in crazy attire (myself included), gasping for attention when the red carpets roll out for Fashion Week. There’s a simplistic, nordic refinement to everyone’s look here. Tomorrow, I’ll watch the Green Fashion Competition, I’m so excited to see Dutch fashion in action, so check back for more AFW coverage soon! I die for those orange pumps!